Through crossing a Sable Burmese with a black American Shorthair and following up with careful breeding afterwards, the Bombay cat was created in the USA. This cat breed is therefore man-made. The process started in 1953. The breed was developed by Nikki Hornier who at the time lived in Louisville, Kentucky. In the UK the Bombay is part of the Asian cat group. It is described as a ‘black Asian self’. It is one of sub group of Asian self cats. The word “self” refers to solid colors or the strict definition is, “a cat whose parents are of the same (solid) color”2. The breeding in the UK of this cat breed is different1. The breed was created in two ways (a) accidental matings of Burmese with random bred cats in the 1960s and (b) a breeding program that was based on a Burmese x Chinchilla mating. The objective, at least in the USA, was to produce a domestic cat that satisfied the need of some to keep or be near a black panther. Perhaps more accurately the purpose of this breed was to create an exotic domestic cat resembling a black panther. After initially disappointing results, Nikki, achieved her objective of a muscular, black cat with close lying, short fur. The word “Panther” euphemistically means a black big cat. One such cat is the melanistic leopard of India. This Bombay cat is named after one of the major cities of India, Bombay, now named Mumbai. This reminds me of a number of other breeds with similar (exotic cat) objectives some having been created by crossing different breeds of domestic cat (e.g.Toyger – to resemble a Tiger, Ocicat, Serengeti) and some by crossing wild cats with domestic cats (e.g. Chausie, Savannah, Bengal and Safari). There seems to have been a phase in the history of the cat fancy when all things wild and exotic became desirable. This happened during the second half of the 20th century and continued throughout that period to today. Photograph strictly © copyright Helmi Flick – see a super large format version of this picture plus some more about the Bombay cat breed. This high quality Bombay cat was photographed at the Waxahachie Cat Show, Texas (November 22-23rd 2008) . Click on this link to read and see more about this cat and the success achieved at this show. At The International Cat Association’s 2008 Annual Championship Cat Show on August 31, 2008 in Arlington, Texas, Passion was the highest-scoring winner, or “Best of the Best”– in the ALTER category. Toriland Passion of Chaparral, is owned by Jeff & Heather Roberts. Lots more success is to come, I am sure. Bombay cat – VINDOURO KALIENTE OF KATSNKLAMMS. The owner is Wendy Klamm. The photograph is strictly ©copyright Helmi Flick. See a super large format version of this photograph plus a picture of this photograph being taken and more…Please respect copyright. KALIENTE, the cat immediately above, was top in the kitten category at TICA, Waxahachie (Texas), Cat Show, 2008. See this picture in large format. 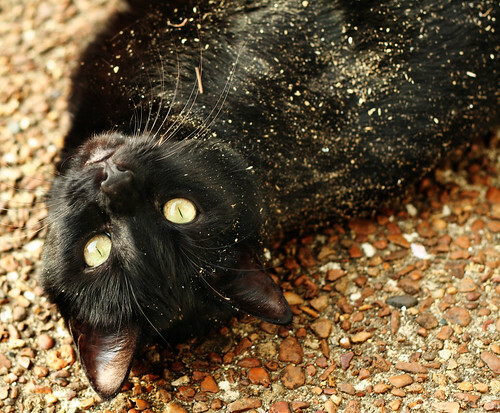 Although Bombay cats are black, in a litter resulting from Bombay to Bombay breeding the recessive gene that produces the sable coloring may be manifest in a kitten. In a Burmese to Bombay cross some kittens will be sable. Sable Bombay cats cannot be cats of this breed, on a strict interpretation of the breed standard. However, it seems that there are sable Bombays, which cannot for obvious reasons be exhibited but can of course make lovely pets. They are very similar to a sable Burmese. In terms of breeding, the gene that produces the black coat is dominant. As a consequence it is relatively easy to maintain the black coat in breeding. The black coat has been described as “patent leather” in recognition of the close lying short hair and sheen. I am reminded of the Havana Brown in respect of the close shiny coat. The coat naturally shows off the muscular, elongated and supple body. The eyes are yellow, copper. There is a fabulous contrast and harmony about the golden eyes and deep black coat. The Bombay cat is slightly larger than the Burmese so cannot strictly be called a black Burmese. They also have longer legs and bodies and are therefore slightly more rangy than the Burmese. As expected this breed of cat combines the robust sensible nature of the American Shorthair with the social skills of the Burmese. This is a medium sized cat at about 8-11 lbs for males and 6-9 lbs for females. This cat is described as “semi-cobby“. Cobby means stocky or well built in human terms. The head is round. The ears medium sized and set wide apart. There should be a slight break in profile between the forehead and bridge of the nose. The muzzle should be short. This is a moderate looking cat. The difference between a Bombay and black American Shorthair of Domestic Shorthair is the difference between the breed standards. In particular, the facial appearance is different and the coat will look different. The Bombay is smaller than the American Shorthair. You are unlikely to see a black American Shorthair purebred cat as black is not a popular colour unless it is very refined as is the case on the Bombay. As to their character, they will tend to follow the Burmese, which means relaxed, friendly and people orientated. They like being close to their human companion. That may translate into joining the person in bed. They can be talkative and having a calm nature are adapted to indoor living. It is said that over the years the look (and character?) has diverged from the Burmese. There is, regrettably, a health problem called “Burmese Craniofacial Defect”, which as you might guess from the description results in some kittens very sadly being born with deformed heads. Kittens that survive are euthanized. This is the same problem affecting the extreme Burmese cat which has been brought to this cat breed. The condition is only concerned with American Burmese cats that are called “Contemporary Burmese” (similar to the word “modern” used for the weggie Siamese) – caveat: some extreme Burmese were exported to the UK. European Burmese are called “Traditional Burmese” and are unaffected. This is because the American Burmese breeding lines carry a genetic defect inherited from a founding cat that had a desirably round head. In breeding into the line the contemporary head, the American breeders also bred in the defect, which is now hard to eradicate. The traditional (British) Burmese is not recognized by the CFA as it is presumably too traditional looking. Read more about Burmese cat health problems. Dr. Clark DVM in his book, “Medical, Genetic & Behavioral Aspects of Purebred Cats”, says that this cat breed may be carriers of genetic anomalies of the skull (mentioned above), heart or spinal canal. Apparently an extreme nose break may be present in some cats causing tearing and/or breathing difficulties as is the case in the contemporary Persian. Current Breed not recognized by GCCF (foremost UK cat association). TICA recognized. Located in Connecticut, USA. Experienced breeder. Also breed Burmese. Hexpride – this link is broken Nov 2016. Located in Salisbury, North Carolina, USA. Also breed Burmese. Typha – Typhast Cats – this link is broken April 2013. Located in Shepperton, UK. For me the notable feature of this UK site over the US sites is the total openness of the location of the cattery and directions and a map provided to help customers find their way – nice one. 2. Robinson’s Genetics for Cat Breeders & Veterinarians fourth edition. 3. The Encyclopedia Of The Cat by Dr Bruce Fogle page 139. This entry was posted in Bombay Cat, Cat Breeds and tagged black cats, bombay cat by Michael Broad. Bookmark the permalink. My newest cat Lucky I think is either part Bombaby or part Asian shorthair. He’s solid black with the exception of a little white near his groin in the shape of a triangle that is noticable when he’s laying down on his side, and a very not so noticable tuft of white on his chest. You have to be really looking for that little bit of white. His fur is very soft and silky. His eyes are a very pretty yellow gold color. His personality is very loving. He loves to talk to people, and will start purring the second you start petting him. He plays fetch with the humans, and tag with the cats. He also has an odd fasciantion with water, and will try to jump in the bathwater when we’re filling the tub to take a bath. The other cats in the house will play with him and groom him when he starts annoying them. Could well be true. The Bombay is a selectively bred moggie, really, and turned into a purebred. I’m seriously leaning towards it, since his profile looks like a Burmese. He’s more slender and not as stocky though, so he’s got to have some other short hair breed in him. When he was little, his ears looked like bat ears on him and his tail was twice as long as his body. He’s now grown into his ears and tail. I will try to get a picture for you, but as you’ve stated pictures of black cats are hard to take. Our beloved cat Pepper we have always thought is largely Bombay, and this article confirms that believe. Two things do stand out: he almost never talks, when he does it is in a very tiny voice; and he is far above the weight norm mentioned, being about sixteen pounds and not overweight, just a big cat. Hi, I have been trying for about 3 years to figure out my cats actual breed. The humane society we adopted him from wasn’t sure what breed so they told us that he will be known as a domestic short hair. My cat bongo seems to have a lot of the same characteristics of a Bombay, but he is bicolor he mostly black except for some the face, neck, and belly. Is it possible for Bombay cats to be bicolor? He is pretty much all black and little bit of white. If he has some white, even a tiny bit, he can’t be a Bombay. I guess you know that. Sorry, no it is not. He sounds like an adorable black and white cat – bicolor cat and a random bred cat – not a cat breed. I have had two cats like that and loved them. Except for the drawing at the base of the page they are all real! There are some drawings of cats on this site but not many. All the best pictures are by Helmi Flick a professional cat photographer and a well known person in the cat fancy. Are all of these pictures real cats or are some stuffed and/or drawings/paintings of cats?